In 1952, Lt. Eric Pedersen purchased a small Mongolian mare from a boy at a Seoul race track. Her job was to be a pack horse, carrying ammunition to the front lines during the Korean War. But through her courage on the battlefield and her endearing antics off the field, the horse who eventually was known as Sgt. Reckless became a beloved national hero. This week, a life-sized statue of Sgt. Reckless will be unveiled at the National Museum of the Marine Corps to honor her contributions to the war effort. Two-legged soldiers who served with her will be on site at the dedication. The statue was created by Jocelyn Russell, a Colorado sculptor who specializes in wildlife. During her years of service, Reckless traversed difficult and dangerous paths to transport supplies to the front lines. In the battle for the Nevada Complex, the mare was said to have walked over 35 miles up and down mountain trails, bringing nearly five tons of ammunition up and carrying wounded soldiers back down. Soldiers say she learned the routes and was able to continue packing supplies back and forth on her own. Besides her invaluable help on the battlefield, Reckless could be counted on to boost the troops’ morale. She was known for her insatiable appetite, often sneaking scrambled eggs and pancakes from the soldiers’ breakfasts if they weren’t paying attention. After serving from 1952 through 1960, Reckless was given her retirement at Camp Pendleton in California where she was buried with full military honors after her death in 1968. The U.S. military awarded the mare two Purple Hearts, a Good Conduct Medal, a Presidential Unit Citation, a National Defense Service Medal, among other commendations. 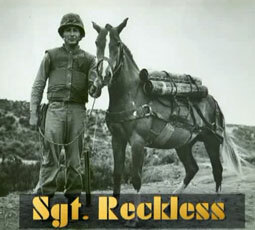 The monument at the National Museum of the Marine Corps is one of several projects spearheaded by Operation Reckless, an initiative to help spread the word about this extraordinary horse. Other projects include a book, movie, and other memorials, including one at Reckless’ gravesite. I’m glad that people are taking efforts to remember this remarkable little horse! That is good. I love Sgt. Reckless! why going are they going to be making a movie about her? I mean there are the racehorse and fictional horse movies why not one about an actual horse that saved so many of our soldiers? I agree with kygal, they SHOULD make a movie about reckless. she is amazing! I’ve seen this before but it’s worth seeing again. What an amazing horse. And best of all, she’s really an example of how all our horses are at heart. Great friends who will do anything for us! When I was in school, I wrote a report on Reckless. 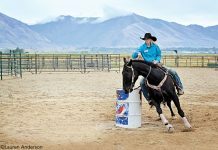 Lots of good in one horse. What a wonderful, fantastic story of another brave horse. It is right that she is being honored for her service.